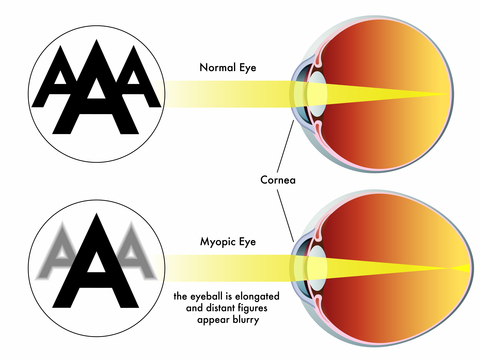 Myopic macular degeneration (MD) develops in people who have severe myopia or nearsightedness. Myopia is the result of the eye being longer than what is considered normal. This abnormal shape or extra long eyeball results in the thinning of the retina. Those who have myopia are at a higher risk of getting macular degeneration - however it is not age related macular degeneration it is the result of the length or the shape of the eyeball not age. Myopia tends to be hereditary. If a parent has nearsightedness there is a good chance that one of their children will have it as well. Often this diagnosis takes a person by surprise because it occurs at a much younger age and perhaps no one told them that their short sightedness or myopia puts them at a higher risk of developing macular degeneration. The thinning of the layers around the peripheral retina also puts a person at a higher risk for retinal holes or a retinal detachment. Most people associate macular degeneration as an eye condition that only affects older people. But myopic MD can occur in young adults in their 30's and 40's. At at a stage in life with growing families and demanding careers this retinal condition can threaten a person's sight and their independence. 1. 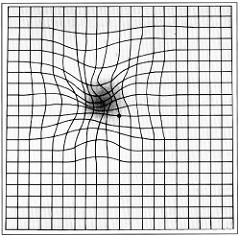 Distortion of vision - Straight lines appear crooked. "Just before Thanksgiving I noticed vertical lines, like door frames, did not appear straight." "I noticed my right lens must be smeared, because I can't see through it." "In the three weeks I had lost basically all my centre vision - every day it got progressively worst ... I stared at pictures of the kids burning the faces into my mind so I would never forget." Treatment for degenerative myopia is similar to the treatment for age related macular degeneration. A patient can have dry macular degeneration in one eye and wet macular degeneration in the other eye. At this time there is no medical treatment for a diagnosis for dry macular degeneration, but wet macular degeneration is treated with anti-VEGF therapy using intra-ocular injections of medications like Lucentis, Avastin and Eylea. Find out what others are saying about their symptoms, treatments, and reactions. "It has been a lonely road. No one truly understands your fear, the pain of the injections, and day-to-day frustrations of just trying to see." "It all depends on your reaction to this eye condition. Things can be overcome, with time and patience you can live a life that is full." "I was diagnosed about 7 years ago with myopic degeneration after seeing waving lines. I have had a few shots of Avastin over the years. I find my sensitivity to light is worsened as well as night driving. If it is raining at night I try to avoid driving." "Now I am 51 years old and I wonder how long? What next? I find it ironic that I have worked hard to eat right, exercise, and watch my weight so that I beat the family history of obesity, heart disease, and diabetes and to be able live a long active life. Now myopic macular degeneration is changing my future. It has been a lonely road. No one truly understands your fear, the pain of the injections, and day-to-day frustrations of just trying to see." "It's been sixteen years since I was first diagnosed with myopic macular degeneration and so far the vision in my good eye has been good. I wear soft contact lenses and live a very full life. Of course there is always the fear that one day my good eye will turn from the dry form to the wet form and then my central vision will quickly be gone. But I try not to live in fear. I hold on to the hope that a cure will be found. I don't regret going through this disease. It has taught me to cherish little things and to be grateful that I still have one good eye. It has taught me to never to take for granted all the things I can do and if one day I completely loose my sight, at least I have had years to prepare. I encourage anyone who has this disease to stay strong and know that all hope is not lost and you can still enjoy your life."